This entry was posted on February 8, 2013 by Tinteán Editorial Team/EMcK, in History, News. Bookmark the permalink. We all have apocryphal stories about St Brigid, it seems. This is very evident at the BrigidFest gathering, which celebrates her feast day every year at the Celtic Club in Melbourne. This year’s well-attended function was no exception. 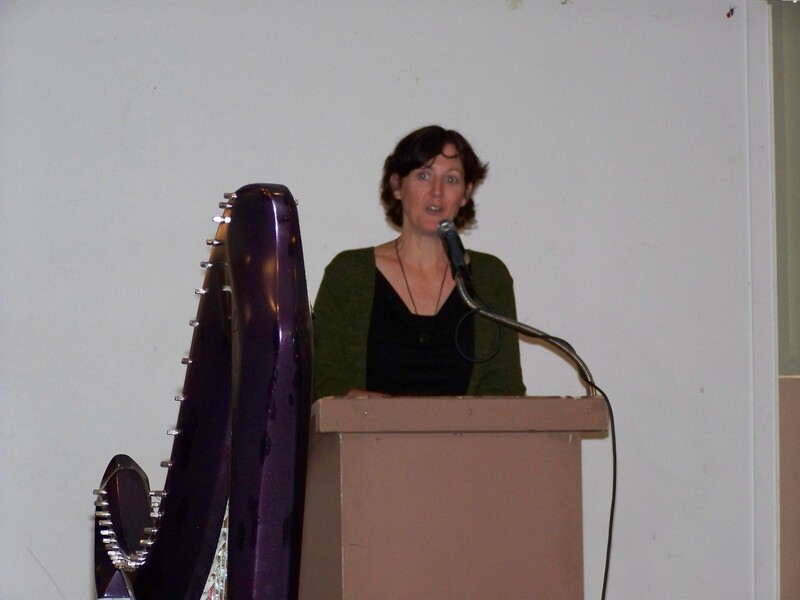 Well known harpist, Cath Connelly, was the guest speaker. Ms Connelly, as well as being a gifted performer and teacher of the harp, also completed a Master’s degree at the Melbourne College of Divinity, exploring in her thesis the mythic figure of Brigid and her representations as Celtic Saint and as a goddess. Evidence of St Brigid’s existence is scant. However, there are historical details which indicate that a formidable religious woman founded a double monastery in Kildare in the early 6th century. She was the subject of a Life written about her by the 7th century historian, Cogitosus. Rumour has it that she was inadvertently consecrated a bishop and on more than one occasion celebrated Eucharist. She has always been honoured as one of the patron saints of Ireland along with St Patrick and St Columcille, who most certainly did exist and stories of her generosity and ‘miraculous’ activities abound to this day! Of course there were not the same rigours about the involvement of woman in these roles, including being abbesses of large double monasteries, in the early Celtic church as there are nowadays. There is ample evidence of Celtic religious women attaining high profiles in ecclesiastical affairs until the Celtic church disintegrated under the double whammy of the Synod of Whitby and the incursions of the Vikings. In her talk, Cath Connelly suggested that the saint and the goddess were one and the same (and this view is now the accepted orthodoxy about Brigid in the Celtic feminist canon, which embraces – not Celtic paganism – but a more liberal neo-paganism). Brigid was, she suggested, a ‘threshold figure’ acting as an intermediary between the 6th century worlds of Christianity and paganism. She was, it seems, ideally suited to the such a role, with a pagan father and a Christian mother and tradition having it that she was in fact born on the actual threshold of a house! This perception of her in early Celtic culture as Saint and goddess, gave her the role of being a ‘bridge’ between the hearth (Christian hospitality) and the heath (pagan wildness) and between druid (pagan priest) and deacon (Christian celebrant). In spite of the persuasiveness of this argument, and the fact that quite respectable scholars postulate that the Christians transformed an earlier polytheistic goddess into one of their own, (ironically there is probably more specific evidence of the existence of a cult surrounding a Celtic goddess, Brigid, who was worshipped at a tentatively identified site only a few kilometres from Kildare), – I believe that the blurring of the distinctions between Saint and goddess, so that they become one and the same person, is to undermine the saintliness of the Saint. Ms Connelly acknowledged that the Saint’s worldview, as far as is known, was definitively Christian rather than being influenced by Celtic paganism; that her life was dominated by her love for and loyalty to Jesus and her renowned hospitality was rooted in the gospel imperative to serve the poor and oppressed. It seems most unlikely that St Brigid with her highly developed Christian spirituality and deeply ingrained sense of service to others would for one moment countenance being assigned the role of ‘goddess’ with its implications of being the object of worship and sacrifice, attributes, which in St Brigid’s eyes could only belong to the Christian godhead. That said, nobody would quarrel with the claim that Brigid herself ‘belongs to everyone’. Her role of being a ‘bridge’ between disparate worlds is a relevant today as it was in her lifetime. Her vision and mission are made available in the social justice/ecumenical ministries of the Brigidine Order and their many associates who are involved in various prayer centres in both Ireland and Australia and in the ongoing involvement of her neo-pagan followers in promoting her influence and spirituality in a world, which sorely needs her wit and wisdom.